The Sea Ray 260 Sundancer is a typical 8m American-built sportscruiser, oozing quality fitout and style. Its big 300hp Mercury MerCruiser engine is an impressive performer, and optioned up, this Sea Ray is an even better boat. The 260 Sundancer is the latest 2015 Sea Ray model, with new-look cabin windows and subtle changes to the hull shape. Despite being quite tall in comparison to its length it manages to retain a sporty look, enhanced somewhat by its optional fibreglass arch, a swooping sheer line and even more dramatic hull line and rubrail. 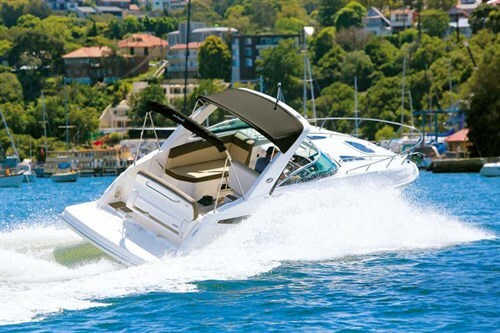 Throughout the Sea Ray 260 Sundancer are indications of good engineering and design. From the extended swimplatform to the bow with its well-secured sunpad, all deck space is maximised to pack in as much entertaining and lounging as possible. Access is from either the rear platform through a portside gate, or over the sides topped with non-skid and integrated inboard steps. Both options have grabrails and in the cockpit the aisles are wide and grabhandles and drinkholders abound. Cockpit seating creates what Sea Ray calls a conversation area of lounges in a circle with room for nine or 10 people when the helm seat is reversed. A teak table is stored under the rear lounge and has two sets of aluminium posts that allow it be used for lunch or lowered to make a wide sunlounge with the addition of extra cushions. There is also dedicated storage for all cushions and supports. As well as its forward-facing position the rear section of the lounge converts to a sunpad or flips to make a rear-facing seat when the boat is at rest, making the swimplatform even more accommodating. Along with the twin helm seat, the chaise lounge to port allows another two passengers to interact with the skipper underway. 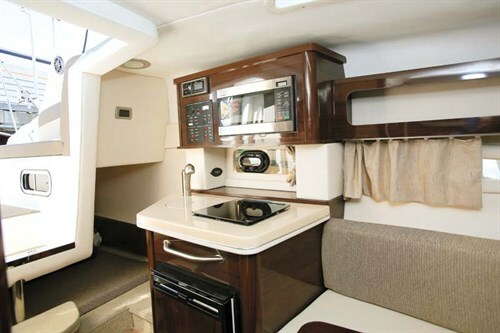 Downstairs, the neatly laid-out cabin features a chic Prestige Cherry interior. Against the dark timber are cream walls and ceiling, and cushion fabric a lush beige. 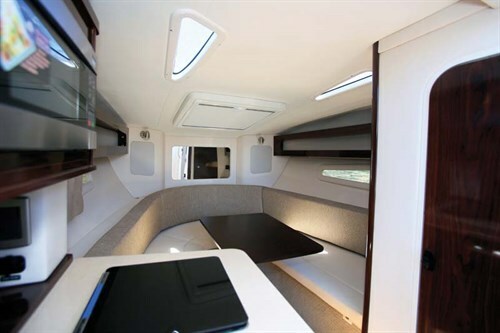 Thick marine carpet is sensibly protected by clip-off Sunbrella material to keep the interior looking pristine. The vee-berth in the bow has a long table for dining and also converts to a large bed so, with the mid-cabin double under the cockpit sole, there are options when overnighting for a couple to leave the dinette in place or share the space, albeit with limited privacy. The cook gets an electric/alcohol single-burner cooktop and a sink with fresh hot-water set into a granite-style Corian benchtop. A 22lt Microwave works from shorepower or through an onboard inverter and there’s also a dual-power Dometic fridge-freezer. Opposite the galley is an enclosed head with vacuflush toilet, a hand-held shower and a Corian vanity. The space has good ventilation and the teak floor covering is a nice nautical touch. On a boat this size you shouldn’t expect anything too spacious so showering is a sit-down operation as headroom isn’t over-generous. Happily, there’s a transom shower to enjoy as an alternative. With a moderate crosswind the tabs kept the boat on an even keel, and on the plane the tabs came into effect for best fore-and-aft ride and the most economical fuel burn. 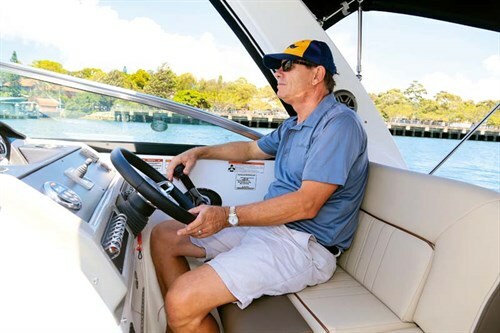 It’s a good addition to this style of high-riding sportsboat and while they seemed to work well the tabs can be returned to manual at the touch of the control pad if you don’t agree with how they are operating. The 300hp 5.7lt V8 MerCruiser 350 MPI has plenty of deep-throated rumble and had the efficiently-shaped hull planing at an impressive 10kts – no doubt helped by the superior drive of the big counter-rotating props. It felt rock steady cruising at 24kts and around 3750rpm cutting across the chop and wake of other boats. 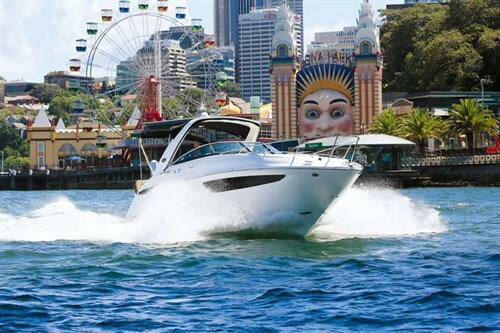 The Sea Ray’s 3500kg weight helps it belt through waves, and any larger wake is taken in its stride without undue banging or any of the fittings rattling loose. I saw 34.2kts at 5000rpm, perhaps a bit under what I might have expected but not bad with a full load of fuel and a new engine – and plenty fast enough for a blast around your local waterway to a quiet anchorage for the day, or perhaps a night or two on the water. Handling is sporty and precise at higher speeds. In sharp, low-speed turns under power it leans over and pushes water off its big shoulders but doesn’t dig the nose in for any nasty surprises. Our review boat was loaded with sensible options that make ownership even more enjoyable. A bowthruster and the auto trim tabs will certainly enhance the driving experience, while the arch and bimini ensure peaceful relaxation under a summer sun. See the full version of this review in Trade-A-Boat #251, March / April 2015. Why not subscribe today?